Leading transportation policy decision makers from around the country are gathered at NYU today for the National Association of City Transportation Officials’ “Designing Cities” conference. It’s an exciting moment for livable streets and sustainable transportation, with the people who are implementing a new generation of complete streets, surface transit improvements, public spaces, and parking policies sharing their expertise and helping to spread innovation to other cities. Streetsblog will have coverage from the conference throughout the next few days. To start off we’ll share some of the new findings from NYC DOT about how local commerce is faring in some specific places after the implementation of safer, more sustainable streets. The case studies are part of a DOT report, “Measuring the City” [PDF], explaining how metrics like safety, transit ridership, bike ridership, and economic performance can be applied to streets — a far more productive approach for cities than purely car-centric metrics like Level of Service. The most interesting stuff in the report is the data on retail sales and commercial vacancies, which the Daily News and the Post both picked up today. Usually, before and immediately after a new bus lane, bike lane, or public plaza is installed, you can count on at least a few naysayers among nearby businesses. No matter how dysfunctional the status quo may be for pedestrians, cyclists, bus riders, and drivers, if a project helps to solve those problems but happens to take away a few parking spaces, there will be gripes. 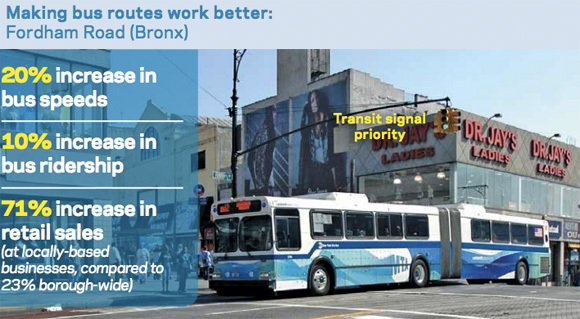 After the installation of Select Bus Service on Fordham Road in the Bronx, local businesses along the route saw a 73 percent increase in retail sales. It’s not just the tentative economic recovery that explains the improvement: Borough-wide the increase has been just 23 percent. This same project, which eliminated some curbside parking and added parking meters on side streets, was repeatedly blasted by some local merchants soon after it debuted. But with a 10 percent increase in bus ridership, added foot traffic seems to be providing a retail boost. At the Pearl Street plaza in DUMBO, one of DOT’s earliest plaza projects, retail sales increased 172 percent compared to 18 percent borough-wide. The full report includes some interesting data points about a few other DOT redesigns, the PARK Smart program in Park Slope, and the commercial parking program on Church Avenue. It’s well worth a read. It is this level of understanding and sophistication that we’re going to lose once Bloomberg’s term is up. Looking at the current crop of mayoral candidates, we’re in for more crashes, less economic vitality, and higher medical bills. Just met one yesterday who couldn’t even tell me the City’s official speed limit.